We really wanted Munchkin Legends 2 to come out earlier, but things happen. Legends 2 will release in August of 2014. 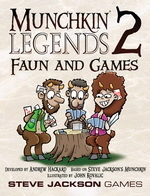 The Munchkin Legends 2 Launch Kit, for retailers, will release in July of 2014, which means you may be able to get the expansion at your FLGS a little earlier than its official street date.